1. Which of the following contains blood poor in oxygen? 3. Which of the following substances are produced by the light reactions of photosynthesis? 4. 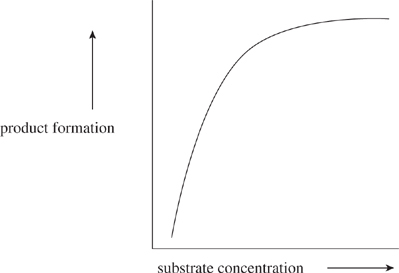 Consider the following graph of substrate concentration vs. product formation. Assume enzyme concentration to be constant. Why does the graph level off at high substrate concentrations? A. All the enzyme is used up, and product formation cannot occur without it. B. There is no more substrate to be converted into product. C. Substrate concentration, exceeds enzyme concentration, and all active sites are saturated. D. The reaction has run to completion. E. An inhibitor has been added, and it has slowed down the rate of product formation. 6. Which of the following chemical formulas could represent a monosaccharide? 12. Two organisms live in close association with each other. One organism is helped by the association, whereas the other is neither helped nor harmed. Which of the following terms best describes this relationship? 13. Cardiac output (the amount of blood pumped out of the heart in one minute) and blood pressure are directly proportional. Which of the following graphs best depicts the relationship between cardiac output and blood pressure? 17. Tropisms refer to movements made by plants toward or away from certain stimuli. "Positive" tropisms refer specifically to movements toward a stimulus, whereas "negative" tropisms refer to movements made away from a stimulus. 18. 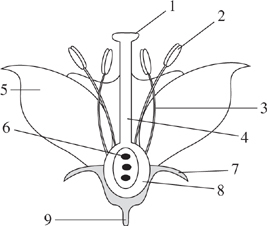 Tropisms refer to movements made by plants toward or away from certain stimuli. "Positive" tropisms refer specifically to movements toward a stimulus, whereas "negative" tropisms refer to movements made away from a stimulus. 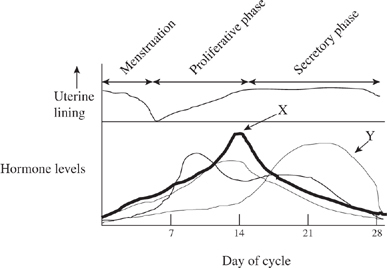 Based on the peak levels of hormone X, on what day of the cycle is ovulation most likely to occur?